The water felt surprisingly chilly, and for a moment I hesitated before completely immersing myself in the cool, clear water. More a creek than a river this time of year, this crossing of the West Fork San Gabriel River was at mile 17 of the 2012 Mt. Disappointment 50K. At 2760′, it’s the lowest point on the course and marks the beginning of the tough 5.4 mile climb up Edison Road to Shortcut Saddle (4790′). Edison Road (FS Road 2N23) zigzags up an exposed, south-facing chaparral slope. The climb is warm on the coolest of days — today it was going to be torrid. Southern California was locked in the grasp of a record-setting, multi-day heat wave. During the week I’d taken a thermometer on a run and measured a temperature of 107.6°F on a breezy day at Ahmanson Ranch. All week I’d been checking the computer weather models and watching the temps in the San Gabriel Mountains, hoping for a break in the weather. Nada. The day before the race the “in the sun” temps at the Clear Creek RAWS, near the race course, reached a blistering 120°F. Submerged up to my neck in sublime coolness, I dunked my head. To this point the heat hadn’t been too bad. Much of the first 17 miles had been shaded and tolerable, and I’d been doing everything I could to stay cool. The “not too bad” part was about to end. Most of the next 9 miles would be brutally exposed and facing directly into the sun. The dip in the pool only took a couple of minutes, but was worth every single second. Even if my shoes were wet and my jelly beans and salt tabs melted gobs of sugar and salt it was worth it! Incredibly, the cooling soak made the Edison climb almost enjoyable. Almost — it still took about 50 minutes to get to the Edison Road aid station and another 50 to get up to Shortcut. At Shortcut the fantastic aid station volunteers filled my Camelbak with Heed and ice, and I ate a couple of big chunks of watermelon (really good watermelon) and drank a little cola. I felt good, but should have been thinking ahead and taken a couple of minutes to really cool down here. The ice water sponges were just sitting there waiting to be used and I passed them by. A little too soon I was on my way, and in a few minutes was jogging down the Silver Moccasin Trail. In the extra-strength rays of the noontime sun, the rocky canyon was a solar blast furnace. Temps were well beyond what I had experienced on afternoon runs earlier in the week. At any instant I thought I might spontaneously combust. I kept watching the runner ahead of me, expecting him to disappear in puff of smoke. And there wasn’t much relief lower in the canyon. Most of the trees along the creek had been burned in the Station Fire. There was almost no shade, and in the recovering vegetation the humidity (and heat index) was elevated. After an interminable time I finally reached West Fork. The pooled water in the W.F. San Gabriel wasn’t as cool as at the lower crossing, but was still refreshing. (The hose from the water tank that Gabor sets up at the aid station was probably cooler and cleaner.) 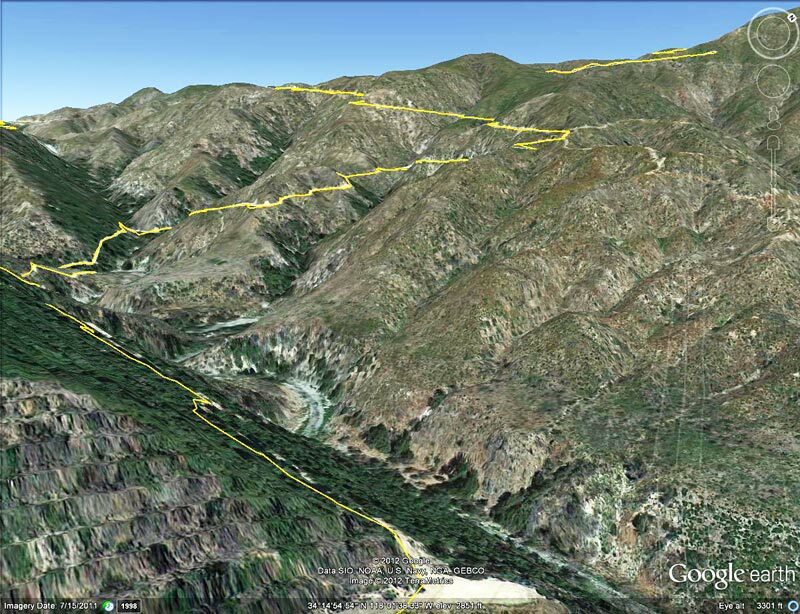 I refilled my Camelbak, and with a cup of cola and ice in hand, headed up the Gabrielino Trail toward Kenyon Devore. 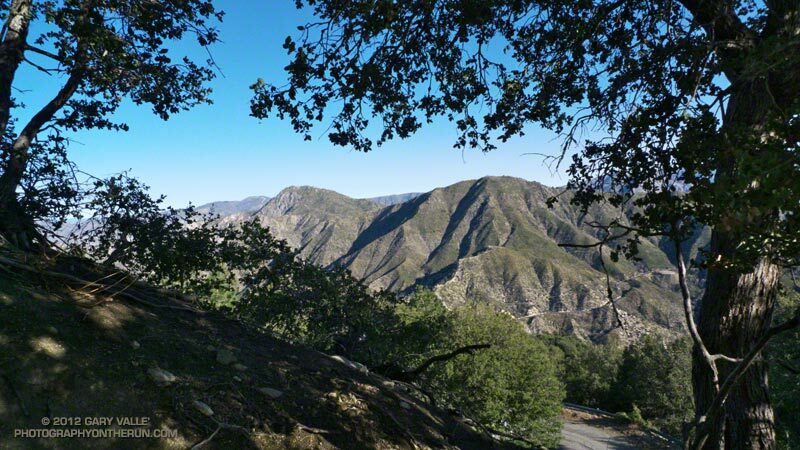 The climb up the Kenyon Devore Trail was — and always is — grueling. Edison Road is tough because some of it is steep and most of it is exposed and hot. KD is tough because most of it is steep, parts of it are hot, and you’ve already done 26+ miles. I took it easy on the Gabrielino Trail, which has some runnable sections, with the hope of being able to maintain a steady pace on KD. It was warm on the upper part of Kenyon Devore, but at least there was some shade. Last year’s race was unusually hot, but this year’s race was even hotter. This year the temperature (in the shade) on Mt. 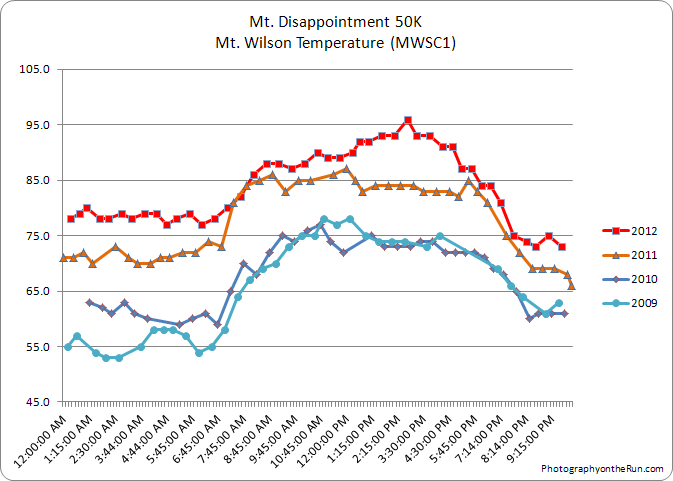 Wilson hit 86°F a little past 8:00 am and climbed to 96°F by the midafternoon. 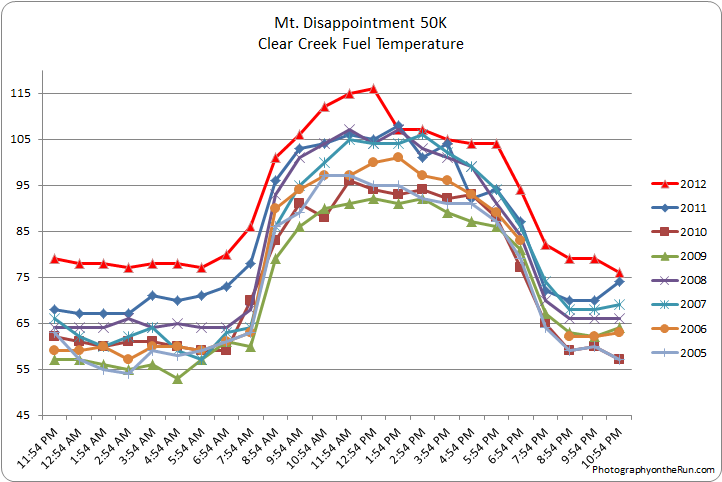 The temperature (in the shade) at nearby Clear Creek was over 90°F for most of the race, and “in the sun” temps topped out at 116°F! This was my eighth Mt. Disappointment 50K and by far the hottest and most difficult. How difficult? 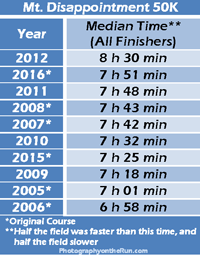 This year’s middle-of-the-pack time — the median time for all the finishers — was 8 hours 30 minutes. This was nearly 45 minutes longer than the median time in 2011, and 90 minutes longer than in 2006. One of the main challenges of the Mt. Disappointment 50K is that it starts and ends on Mt. Wilson — the high point of the course. The original course was run from 2005 to 2008, but because of the Station Fire and Mueller Tunnel closure variations of the original course have been done since 2009. This year Mueller Tunnel reopened and we were able to do the part of the original Mt. 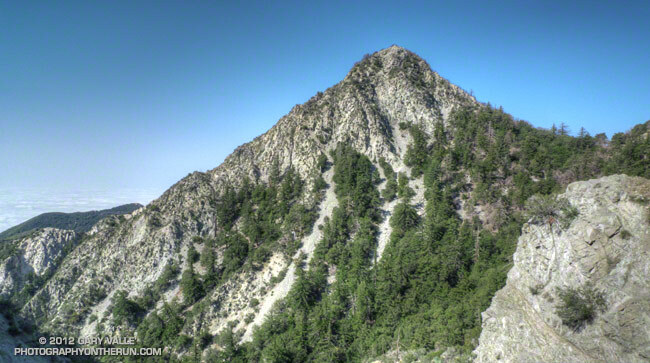 Disappointment course that goes from Eaton Saddle up the San Gabriel Peak Trail to the shoulder of Mt. Disappointment and down to Red Box. In this interactive Google Earth browser view of the 2005-2011 courses the 2012 course followed the 2005-2008 (green) course to Red Box and then the 2010 (red) course for the remainder of the race. Checking a few GPS track files with SportTracks and using DEM corrected elevations, it looks like the 2012 course distance and elevation gain/loss were about the same as 2011. Many thanks to Gary & Pam Hilliard, Fausto & Cindy Rowlan, and all of the Mt. Disappointment 50K Staff, volunteers, HAM radio operators, Sierra Madre SAR personnel, runners, and sponsors that helped to make this event happen! Check out the results and photos on the Mt. Disappointment web site!